A friend celebrated their Birthday on February 14th, so I created a red-free anti-Valentine’s Birthday card for them. Using Basic Gray Archival Ink to stamp the image, I coloured it using Calypso Coral and Old Olive Watercolor Pencils. I then used a Blender Pen to soften and darken various areas of the flowers and leaves. 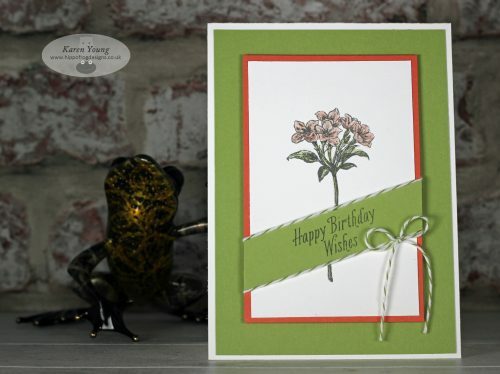 I chose the same colours for matting and layering for a coordinating look and a Thick Whisper White base card. To finish the project, I’ve added an Old Olive Baker’s Twine bow and highlighted the flowers with Wink of Stella. Every year, there is a Sale-A-Bration item that becomes a firm favourite amongst my customers. This year is no different, with the Avant Garden Stamp Set taking the top spot. It’s becoming one of my favourite items too! I love how this set allows you to create a variety of beautiful cards really quickly with minimal effort. Sale-A-Bration runs until the end of March so there is still time to earn this and other fabulous items. There will be 3 new SAB items added on 21st February, so watch this space for more details. Items are FREE with every £45 you spend, head to my Special Offers page for more information.